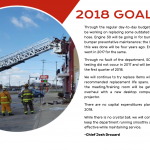 2018 Goals – Through the regular day-to-day budget, we will be working on replacing some outdated 21⁄2 inch hose. Engine 30 will be going in for bumper-to- bumper preventative maintenance; the last time this was done will be four years ago. Engine 29 went in 2017 for the same. Through no fault of the department, SCBA flow testing did not occur in 2017 and will be done in the first quarter of 2018. We will continue to try replace items with NFPA recommended replacement life spans. In 2018 the meeting/training room will be getting an overhaul with a new desktop computer and projector. There are no capital expenditures planned for 2018. While there is no crystal ball, we will continue to keep the department running smoothly and cost effective while maintaining service.